In this study, the sets of equation were extracted by Genetic Programming (GP) for thermal stress analysis of one-dimensional functionally graded rectangular plates. First, thermal stress analyses were performed using a finite difference method for a sufficient number of compositional gradient exponents. Then, equation sets were obtained by the GP using the maximum and minimum equivalent stress levels obtained from these analyses. Appropriate models are produced for equivalent stress levels at compositional gradient exponents. The models achieved these levels 100 times faster than the finite difference method by using GP. GP provided significant time gain in deriving sets of equations for thermal stress analysis of plates with current boundary conditions. Kakac S., Pramuanjaroenkij A., Zhou X.Y., ‘‘A review of numerical modeling of solid oxide fuel cells’’, International Journal of Hydrogen Energy, vol.32, no.7, pp.761-786, 2007. Ruys A., Popov E., Sun D., Russell J., Murray C., ‘‘Functionally graded electrical/thermal ceramic systems’’, Journal of the European Ceramic Society, vol. 21, no.10-11, pp.2025-2029, 2001. Koizumi M., Niino M., ‘‘Overview of FGM research in Japan’’, MRS Bulletin, vol.20, no.1,pp.19-21, 1995. Natali M., Romanato F., Napolitani E., Salvador D.D., Drigo A.V., ‘‘Lattice curvature generation in graded InxGAs/GaAs buffer layer’’,Physical Review B, vol.62, no.16, pp.11054-11062, 2000. Natali M., Romanato F., Napolitani E., Salvador D.D., Drigo A.V., ‘‘Lattice curvature generation in graded InxGAs/GaAs buffer layer’’,Physical Review B, vol.62, no.16, pp.11054-11062, 2000. Noda N., ‘‘Thermal Stresses Intensity Factor for Functionally Gradient Plate With an Edge Crack’’, International Journal of Thermal Stresses, vol.22, no.4-5, pp.477-512, 1999. Shabana Y.M., Noda N., ‘‘Thermo-elastic-plastic stresses in functionally graded materials subjected to thermal loading taking residual stresses of the fabrication process into consideration’’, Composites Part B: Engineering, vol.32, no.2, pp.111-121, 2001. Praveen G.N., Reddy J.N., ‘‘Nonlinear transient thermoelastic analysis of functionally graded ceramic-metal plates. International Journal of Solids and Structures’’, vol.35, no.33, pp.4457-4476, 1998. Turteltaub S., ‘‘Optimal control and optimization of functionally graded materials for thermomechanical processes’’, International Journal of Solids and Structures, vol.39, no.12, pp.3175-3197, 2002. Cho J.R., Ha D.Y., ‘‘Optimal tailoring of 2D volume-fraction distributions for heat-resisting functionally graded materials using FDM’’, Computer Methods in Applied Mechanics and Engineering, vol.191, no:29-30, pp.3195-3211, 2002. Na K. S., Kim J.H., ‘‘Volume fraction optimization for step-formed functionally graded plates considering stress and critical temperature’’, Composite Structures, vol.92, no.6, pp.1283-129092:1283-1290, 2010. Xiang Y., Zhou Y., ‘‘A dynamic multi-colony artificial bee colony algorithm for multi-objective optimization’’, Applied Soft Computing, vol.35, pp.766-785, 2015. Nemat-Alla M., ‘‘Reduction of thermal stresses by developing two-dimensional functionally graded materials’’, International Journal of Solids and Structures, vol.40, no.26, pp.7339-7356, 2003. Baykasoğlu A., Özbakır L.,Tapkan P., ‘‘Artificial bee colony algorithm and its application to generalized assignment problem’’, Swarm Intelligence: Focus on Ant and Particle Swarm Optimization, vol.532, ISBN 978-3-902613-09-7, 2007. Cho J.R., Shin S.W., ‘‘Material composition optimization for heat-resisting FGMs by artificial neural network’’, Composites Part A: Applied Science and Manufacturing, vol.35, no:5, pp.585-594, 2004. Goupee A.J., Vel S.S., ‘‘Optimization of natural frequencies of bidirectional functionally graded beams’’, Structural and Multidisciplinary Optimization, vol.32, no.6, pp.473-484, 2006. Ashjari M., Koshravan M.R., ‘‘Mass optimization of functionally graded plate for mechanical loading in the presence of deflection and stress constraints’’, Composite Structures, vol.110, pp.118-132, 2014. Karaboğa D., Öztürk C., Karaboğa N., Görkemli B., ‘‘Artificial bee colony programming for symbolic regression’’, Information Sciences, vol.209, pp.1-15, 2012. Apalak M.K., Karaboğa D., Akay B., ‘‘The Artificial Bee Colony algorithm in layer optimization for the maximum fundamental frequency of symmetrical laminated composite plates’’, Engineering Optimization, vol.46, no.3, pp.420-437, 2014. Apalak Z.G., Apalak M.K., Ekici R., Yıldırım M., ‘‘Layer Optimization for Maximum Fundamental Frequency of Rigid Point-Supported Laminated Composite Plates’’, Polymer Composites, vol.32, no.12, pp.1988-2000, 2011. Tahami F.V., Mahkam N., Fard A.M.A., ‘‘Optimum design of functionally graded plates under thermal shock’’, The journal Scientific Bulletin Series D, vol.79, no.3, pp.69-88, 2017. Nguyen T.T., Lee J., ‘‘Optimal design of thin-walled functionally graded beams for buckling problems’’, Composite Structures, vol.179, no.1, pp.469-467, 2017. Gusel L., Brezocnik M., ‘‘Application of genetic programming for modelling of material characteristics’’, Expert Systems with Applications, Vol.38 ,pp. 15014-15019, 2011. Gusel L., Brezocnik M., ‘‘Modeling of impact toughness of cold formed material by genetic programming’’, Computational Materials Science, Vol.37, pp.476-482, 2006. Vassilopoulos A. P., Georgopoulos E.F., Keller T. ,‘‘Comparison of genetic programming with conventional methods for fatigue life modeling of FRP composite materials’’, International Journal of Fatigue, vol.30, pp.1634-1645, 2008. Abhisheka K., Panda B.N., Datta S., Mahapatra S.S., ‘‘Comparing Predictability of Genetic Programming and ANFIS on Drilling Performance Modeling for GFRP Composites’’, Procedia Materials Science, vol.6, pp. 544-550, 2014. Russo I.L.S., Bernardino H.S., Barbosa H.J.C, ‘‘Knowledge discovery in multiobjective optimization problems in engineering via Genetic Programming’’, Expert Systems With Applications, vol.99, pp. 93-102, 2018. Gandomi A.H., Alavi A.H., ‘‘A new multi-gene genetic programming approach to nonlinear system modeling. Part I: materials and structural engineering problems’’, Neural Computing and Applications, vol. 21, pp.171-187, 2012. Koza J.R., Genetic programming: on the programming of computers by means of natural selection, MIT Press, Cambridge, MA, USA, 1992. Maletta C., Pagnotta L., ‘‘On the determination of mechanical properties of composite laminates using genetic algorithms’’, International Journal of Mechanics and Materials in Design, vol.1, no.2, pp.199-211, 2004. Liew K.M., He X.Q., Meguid S.A., ‘‘Optimal shape control of functionally graded smart plates using genetic algorithms’’, Computational Mechanics, vol.33, no.4, pp. 245-253, 2004. Ootao Y., Tanigawa Y., Ishimaru O., ‘‘Optimization of material composition of functionally graded plate for thermal stress relaxation using a genetic algorithm’’, Journal of Thermal Stress, vol.23, pp.257-271, 2000. Ding S., Wu C., ‘‘Optimization of material composition to minimize the thermal stresses induced in FGM plates with temperature-dependent material properties’’, International Journal of Mechanics and Materials in Design, https://doi.org/10.1007/s10999-017-9388-z, 2017. Sette S., Boullart L., ‘‘Genetic programming: principles and applications’’, Engineering Applications of Artificial Intelligence, vol.14, pp.727-736, 2001. Poli, R., Langdon, W., McPhee, N., A field guide to genetic programming, 2008. Poli, R., Langdon, W., McPhee, N., A field guide to genetic programming, 2008. Gan Z., Chow W.S.T., Chau W.N., ‘‘Clone selection programming and its application to symbolic regression’’, Expert Systems With Applications, vol.36, no.2, pp.3996-4005, 2009. Arslan S., Ozturk C., Genetik Programlama ile Kanser Verisinin Öznitelik Seçilerek Sınıflandırılması, 12. Biyomedikal Mühendisliği Ulusal Toplantısı (BİYOMUT), 2017. ISNAD Demirbaş, Munise Didem , Çakır, Didem , Arslan, Sibel , Öztürk, Celal . "Equivalent Stress Analysis of Functionally Graded Rectangular Plates by Genetic Programming". 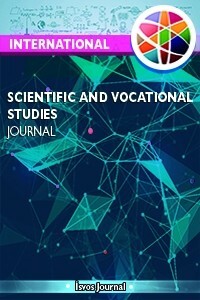 International Scientific and Vocational Studies Journal 2 / 1 (June 2018): 67-80.